There’s a curious line in John Locke’s Second Treatise of Government (1689): “Thus in the beginning all the world was America, and more so than that is now” . The extra fraction of a second we readers take to pin down the antecedent of Locke’s “that” makes us into momentary rubberneckers at a linguistic and conceptual fender-bender. America serves Locke throughout the Treatise as a distant place through which to imagine a distant past. Because America offers “a pattern of the first ages in Asia and Europe,” accounts of the New World can stand in for a conjectured past when the whole world was new (58). 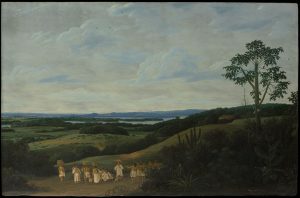 And yet where that substitution–America as a proto-Europe–becomes most explicit, it runs aground: the image of America proves not to coincide with the continent itself, as the primordial fantasy he wants us to imagine becomes “more so” America than the one that actually exists in Locke’s own “now” of the late seventeenth century. The term “Anthropocene” (and likewise its restive offspring: “Capitalocene,” Donna Haraway’s “Chthulucene,” and so on) identifies the planet as a final limit to the way we live–simply put, the modern era (led by Western capitalism) has treated the Earth as inexhaustible and proceeded to damn near exhaust it, taxing the planet’s capacities beyond recognition and perhaps beyond repair . This essay turns to Locke’s America in order to understand how the world came to be imagined as inexhaustible in the first place, how one of the earliest theorists of property accumulation managed to sidestep the problem of a finite planet. I want to suggest that this doubled America, this America that can be “more so” itself, serves Locke as a crucial site of waste, both in the eighteenth-century technical sense of unclaimed or untilled land and in the metaphorical sense of a spillover valve that the system he envisions can’t do without. That technical sense of waste as unowned or unimproved land may be unfamiliar today, but it’s the key to understanding both Locke’s natural law of property and that spillover valve that America provides . 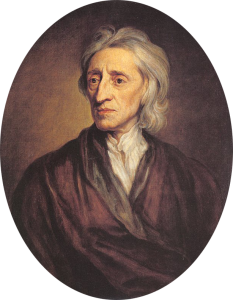 Before the social contract, Locke claims, there are only two moral provisos on property rights: any property claim must leave “enough, and as good” for others in the unclaimed wasteland; and any property that would “spoil,” lie fallow, or otherwise go to waste reverts to the universal free-for-all, like uneaten French fries at a ravenous lunch table (21, 20). With this in place waste and property are opposed by definition; anything in my possession that would go to “waste,” or spoil, reverts to the ownerless “waste,” the pool of the available land and goods. The problem, however, is that England has no such wastes left. Money, which never spoils and never lies fallow if duly invested, has permitted so much property accumulation that what little open space remains must be understood as unclaimed by tacit consensus, public property rather than waste (22). With the spoilage proviso rendered obsolete, what happens to the “enough, and as good”? What waste is left over for England’s dispossessed, the surplus of people to available property that threatens property’s very legitimacy? America takes on the duty of “enough-and-as-good” for England, available because it was supposedly lying waste. By absorbing England’s surplus population, America recalibrates the balance between private property and potential owners. As a deus ex machina for the “enough-and-as-good” conundrum, Locke’s fantasy of America displaces the actual continent. Elsewhere in the Treatise Locke uses indigenous Americans to illustrate the property restrictions outlined above, and even refers to wampum as a form of money not so different from European coins–but at this crucial moment they are eerily absent, an erasure of the imagination with a grimly self-fulfilling history to follow. We should further note that America seems here like an exception to history and geography both. Locke’s imagined homesteaders are “in the state they were at first peopling of the world” but “allowed still” in “this day” to stake out land there, in an inviting vacancy located eternally beyond the “corners” of a world that has filled up considerably since its “beginning.” It’s a space of fantasy, impossibly larger (to borrow Slavoj Žižek’s formulation) on the inside than the outside, like Narnia behind the wardrobe door . Here that space of fantasy becomes a fantasy of space; the Narnia-quality of fantasy architecture–an infinite world in a finite package–gets localized, stitched to a spot on the map like a bottomless imaginary pocket. That elastic fantasy sewn into Locke’s America, “more so” America than the continent itself, makes a finite planet seem to hold an infinite reserve of property–the illusion that Anthropocene accumulation both clings to and makes untenable. 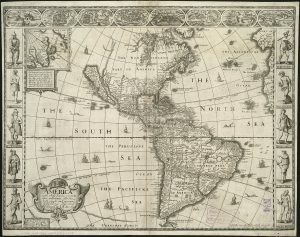 The particular site of that fantasy in Locke’s Treatise, finally, is not a historical accident: a landmark recent study identifies the colonization of the Americas as a key point of departure for the Anthropocene era . Instead, perhaps it’s more on the order of a supreme historical irony that the nation that took up Britain’s mantle as the driving force behind Anthropocene extraction, a nation founded on Locke’s ideals of life, liberty, and the pursuit of property, was founded on the continent whose fantastic afterimage had underwritten those ideals from the very “beginning” . John Locke, Second Treatise of Government. Ed. C. B. Macpherson. (Indianapolis, IN: Hackett, 1980): 29. Future references to this text will be cited parenthetically. Work on America’s importance for Locke is relatively scarce. Key sources include: Herman Lebovics’s “The Uses of America in Locke’s Second Treatise of Government,” Journal of the History of Ideas 47.4 (1986): 567-81; chapter 5 of James Tully’s An Approach to Political Philosophy: Locke in Contexts (Cambridge: Cambridge University Press, 1993); Barbara Arneil’s John Locke and America: The Defence of English Colonialism (Oxford: Clarendon Press, 1996); and Jimmy Klausen’s “Room Enough: America, Natural Liberty, and Consent in Locke’s Second Treatise,” The Journal of Politics 69.3 (2007): 760-9. The bibliography on the Anthropocene is vast, interdisciplinary, and constantly growing; for a good point of introduction, see Dipesh Chakrabarty’s “The Climate of History: Four Theses,” Critical Inquiry 35.2 (2009): 197-222. For competing terms see Anthropocene or Capitalocene? Nature, History, and the Crisis of Capitalism. Ed. Jason Moore (Oakland, CA: PM Press, 2016). Looking Awry: An Introduction to Jacques Lacan Through Popular Culture (Cambridge, MA: MIT Press, 1991): 15. My thanks to Sean Silver for reminding me of this formulation in a recent talk. Simon Lewis and Mark Maslin, “Defining the Anthropocene.” Nature 519 (2015): 171-80. Katherine Binhammer’s article “Anthropocene as Capitalocene” in this collection continues the analysis of imagined economic infinities in the eighteenth century and their relationship to the Anthropocene. This entry was posted in Collections, Eighteenth-Century Anthropocene Cultures and tagged America, Anthropocene, John Locke, Second Treatise. Bookmark the permalink. Nick Allred is a doctoral candidate in English at Rutgers University. His dissertation takes drinking as a paradigmatic "bad habit"--a practice that restructures character through the repeated incorporation of a substance--in eighteenth-century English fiction.